Step back in time to when the simple things mattered most and families gathered around to visit, play games and enjoy each other’s company. At Fiesta Villas in North Myrtle Beach, South Carolina you just might feel the charm of yesteryear. 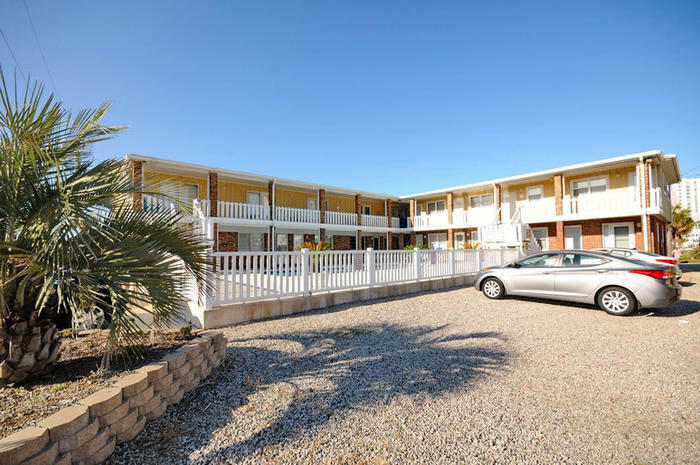 This small North Myrtle Beach condo complex is steps away from the Atlantic Ocean. The white sandy beaches are right across the street from Fiesta Villas though you can hear the waves crashing ashore from this second-row North Myrtle Beach rental. There are comfortable accommodations for up to six people in the North Myrtle Beach vacation rentals at Fiesta Villas. Relax for your North Myrtle Beach vacation in the tastefully decorated one-bedroom North Myrtle Beach condos at Fiesta Villas. Featuring a small kitchen, swimming pool on the ground level and close proximity to the beautiful beachfront, these traditional North Myrtle Beach rentals will make a wonderful location for your North Myrtle Beach vacation. The kitchen in each of these condos in North Myrtle Beach, South Carolina has a refrigerator, oven and microwave. You can do so much more with amenities like these at your fingertips than if you were stuck in a regular old hotel room in North Myrtle Beach, South Carolina. Make popcorn, prepare a hot breakfast for your kids and keep all your juices and soft drinks nice and cold in the refrigerator. Forget about living out of a cooler for the duration of your North Myrtle Beach vacation. The North Myrtle Beach condos at Fiesta Villas are designed so you enter the vacation rental into the living room. The kitchen opens up to the living room and the private bedroom and private bath are tucked away in the back of this North Myrtle Beach condominium. The window air conditioner in each of these North Myrtle Beach rentals will keep you nice and cool even on the hottest days in North Myrtle Beach, South Carolina. And a television will allow you to catch all your favorite shows during your North Myrtle Beach vacation. Outside of your charming accommodations at Fiesta Villas is the bright blue swimming pool. This pool is right across the street from the Atlantic Ocean, another swimming opportunity within easy reach of your North Myrtle Beach rental at Fiesta Villas. Lounge poolside with a good book while you get a suntan or slip into the sparkling blue swimming pool for a refreshing swim. Walk across the street and let your bare feet wade feel the rush of the ocean’s waves. Swimming in the shallow water or jumping the waves at high tide are great fun when you enjoy a North Myrtle Beach vacation at Fiesta Villas. All you need is to take a beach towel across the street to the beautiful beachfront with you. Build a sand castle and go beachcombing for gorgeous seashells that you can take home with you. They make terrific souvenirs and hunting for them on the beach is a photo-worthy moment. Fiesta Villas is a North Myrtle Beach resort that also features a grill and picnic area for its guests. Hamburger sizzling on the grill is a nice meal and you can have it your way and at your pace when you host the cookout yourself. Enjoy the access you have to the grill and the fact that you can hear the waves crash ashore across the street as you grill out for your family. This North Myrtle Beach resort is nestled on the second row in the Cherry Grove section of North Myrtle Beach, South Carolina. That means it is just a matter of blocks until you reach the Cherry Grove Fishing Pier. What fun you can have at that North Myrtle Beach attraction. Rent fishing gear or bring your own and try reeling in your own catch of the day. With the grill area back at Fiesta Villas you can even grill to perfection the fish you catch from the pier. Also in close proximity to Fiesta Villas are live entertainment theatres. There are many from which you can choose, including The Palace Theatre with its special calendar of events. The Alabama Theatre at Barefoot Landing treats you to a musical show you will adore. The Carolina Opry has a singing and dancing production that is perfect for the whole family. For a taste of dinner theatre, you might visit Medieval Times or Pirates Voyage. Your favorite rockers hit the stage at House of Blues and Legends in Concert is a tribute theatre near Broadway at the Beach. Make a tee time for a nearby North Myrtle Beach golf course. There are many around town, close to 100 Myrtle Beach area golf courses. The scenery is divine and the holes are challenging but the game of golf is a pastime for locals and visitors alike and you might as well enjoy the golf landscape during your North Myrtle Beach vacation. Elliott Beach Rentals is not affiliated with onsite management or the HOA of Fiesta Villas.